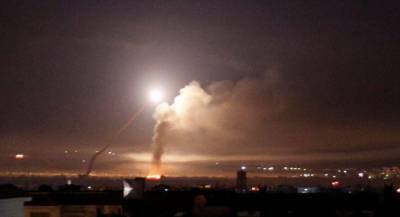 TEHRAN - The Syrian Arab News Agency (SANA) announced that Syria air defense system has intercepted Israeli jet fighters' attacks on Aleppo. Nearly at 23.00 p.m. of Wednesday, March 23rd, 2019, the army air defenses intercepted an Israeli air aggression that targeted a number of industrial sites in Sheikh Najar industrial region to the north-eastern side of Aleppo and downed a number of the hostile missiles, SANA quoted a military source as saying. Earlier, a police source announced that 7 civilians were killed and 14 others wounded in a landmine explosion, left by terrorists, in Maragha village in Aleppo southern countryside. Under the pretext of fighting the terrorist group Daesh (ISIS), US together with some allies have established a so-called international coalition out of the framework of the United Nations since August 2014. The innocent Syrian civilians have so far been killed in Raqqa, Deir ez-Zor, Al-Hasakah and Aleppo. The coalition has also destroyed Raqqa almost completely. This is while, the United Nations Security Council has so far taken no firm action against such attacks. Earlier, the US-led coalition in an air attack on Deir ez-Zor, eastern Syria killed some civilians and injured a number of others who were escaping from ISIS enclaves.